A photographer and video-activist, Kazim has been filming stories of struggle and resistance since 2005, and documenting human rights abuses in Turkey. For years, he has known he could be arrested because of his work. 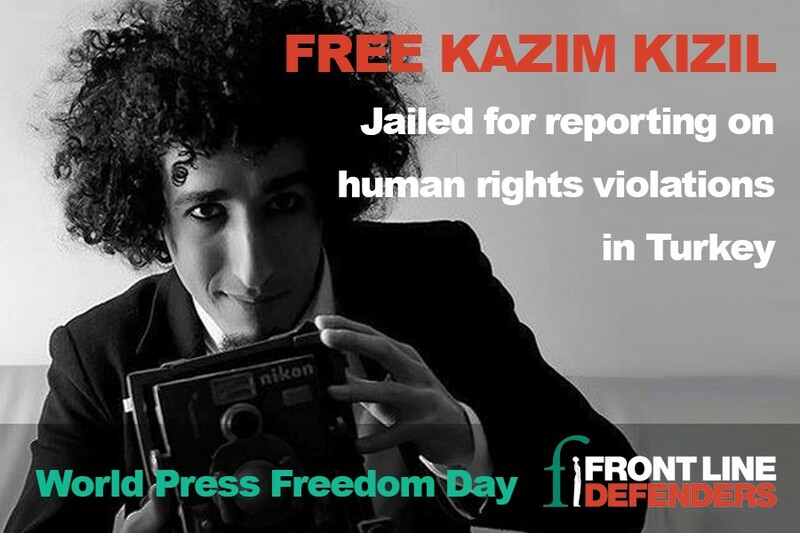 Across the world, human rights journalists like Kazim are using their words and their pictures to hold the authorities accountable, to document and try to prevent human rights violations, to support nonviolent protests and social movements and to fight for the right to freedom of expression. Human rights journalists are arrested, defamed, criminalised and attacked. But across the world, they continue writing, filming, publishing, and taking photos of what oppressive regimes work so hard to hide. On World Press Freedom Day, Front Line Defenders honours the work of Kazim Kizil, Poonam Agarwal, Esteban Vásquez and all human rights defenders who refuse to be silenced. Kazim Kizil is a documentary film-maker and video-activist. During the Gezi Park protests in 2013, he launched a citizen journalism network called Kamera Sokak, with the aim of documenting social resistance movements. In 2015 he filmed the documentary “The Tree of Eternity: Yırca Resistance”, which tells the story of the villagers of Yirca, who successfully opposed the construction of a thermal plant in order to protect their olive trees and their land. Kazim has also produced several short films on human rights issues, including refugees, climate change and child labour. According to his colleagues, “he participated in every form of resistance, demonstration, and social movement with his camera — becoming the eyes and ears of all who could not be there”. Since he was arrested on 17 April, Kazim has been held in pre-trial detention at Menemen Prison. Four days after his arrest, he was charged with “insulting the president”: according to the prosecutor, some of his tweets sent before the protests contained derogatory comments towards Erdogan. The authorities haven’t told him how long he could be held in prison or when the trial would start. Since the attempted coup in July 2016, the human rights situation in Turkey has dramatically deteriorated. Freedom of expression is severely restricted and, according to the Committee to Protect Journalists, 81 journalists were jailed in 2016 — more than in any other country. According to Amnesty International Turkey, thre are currently 120 journalists in jail. More than 175 media outlets were closed in the space of five months and many media organisations now practice self-censorship in order to survive. On 29 April, Turkish authorities even banned Wikipedia, stating the website could be considered “a threat to national security”. Because of Turkey’s overly broad definition of terrorism, scores of human rights defenders and journalists have been arrested and charged with terrorism-related offences, often for speaking out about the Kurdish issue. Post on social media, use the hashtags: #FreeKa, #FreeTurkeyMedia and #JournalismIsNotACrime. 2. Sign a petition addressed to the Minister of Justice demanding Kazım Kızıl’s release. Poonam Agarwal is an Indian investigative journalist who works for the online news portal The Quint, where she mainly writes about human rights issues. She has written on sensitive topics such as Kashmiri militants, political funding, corporate spying and cyber-harassment, and has exposed corruption scams involving high-ranking officials. Last February, Poonam shot a video exposing the abuses suffered by junior soldiers in the so-called Sahayak (“buddy”) system within the Army. Soon after the story published, one of the soldiers featured in the video (whose identity was obscured) was found dead, having allegedly committed suicide. The Army claims the man took his life because of the video and has accused Poonam of being responsible for his death. Shortly after the video was published, the Army filed a complaint against Poonam and on 27 March she was charged with criminal trespassing and abetting suicide, a crime punishable by up to ten years in jail. The case’s Judge stated that prima facie none of the charges against Poonam and her publication stand, and he has recognised that the report was published because of its public interest and not to defame the Army. The next hearing session will be held in June. 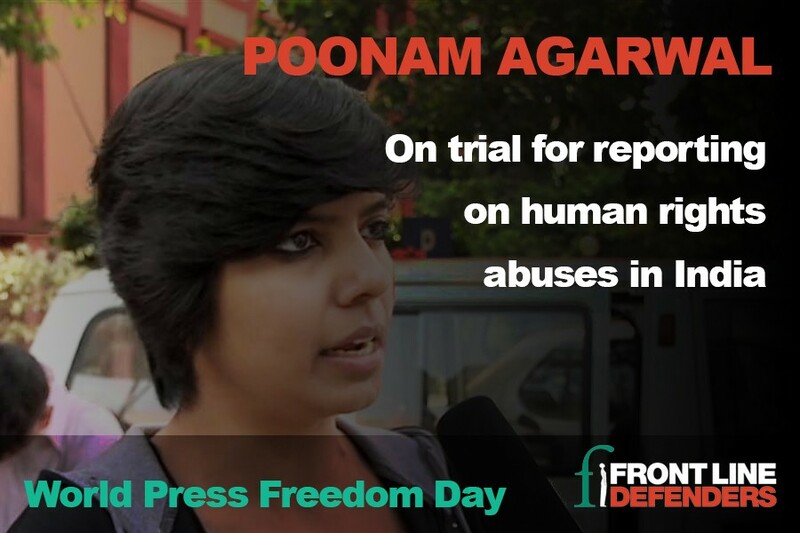 In India, journalists like Poonam who expose human rights abuses are targeted by both state and non-state actors. According to the media watchdog The Hoot, in 2017 there have been 14 attacks against media personnel. In February, Karun Mishra, the Bureau Chief of the Jansandesh Times, was shot dead in Sultanpur. In April, two journalists were arrested in Chhattisgarh. The situation is particularly tense in Bastar, where journalists have reported being followed, having their phones tapped by authorities, and being harassed by vigilante groups. This is the brutal warning human rights defender Esteban Vásquez received on 28 March. On his way home, he found a group of men waiting for him in his community, in the municipality of Santa María (department of La Paz, Honduras), who threatened him with death. Esteban Vásquez is an indigenous leader from MILPAH, an organisation which advocates for the rights of Lenca indigenous peoples to self-determination and to their ancestral lands. He works as a correspondent for Radio Progreso, and has been denouncing the threats posed by mining and dams for the environment and communities in La Paz. On the same week Esteban was threatened, a new smear campaign against Radio Progreso’s director, known as “Padre Melo,” appeared on Honduran social networks, accusing him of receiving money from drug-related activity and of using Radio Progreso to “discredit” his country. Radio Progreso is not the only radio station being targeted. On 8 March, stones were thrown at the door of Radio La Voz Lenca’s headquarters, a community radio station operated by COPINH which reports on indigenous, land and environmental rights. Two weeks later, Radio Dignidad — a project hosted by Movimiento Amplio por la Dignidad y la Justicia (MADJ), an organisation dedicated to combating corruption and human rights abuses — received death threats via its Facebook page. They also received a threatening message with a photograph of their director. 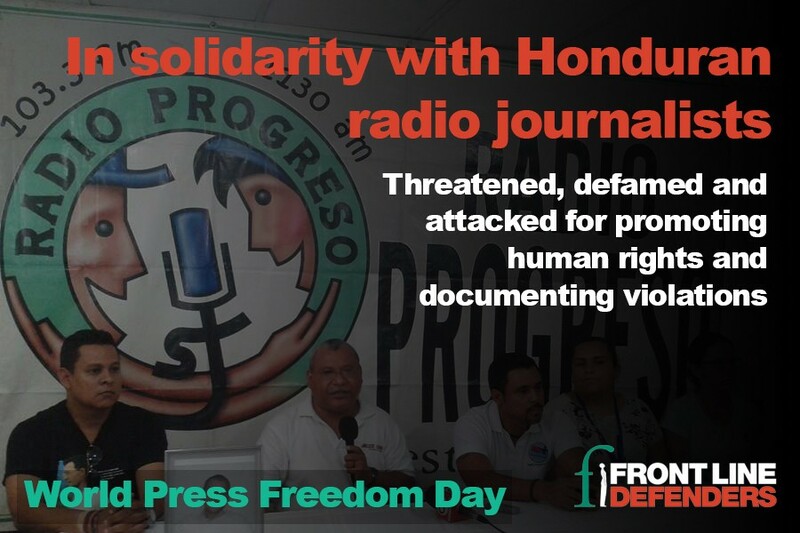 Honduran human rights journalists are constantly under attack. When they denounce the threats they suffer, however, authorities rarely investigate these incidents and offer them protection. In January, the National Commission of Human Rights in Honduras (CONADEH) reported that 69 media personnel and journalists have died since 2001, with an impunity rate of 95 percent. Yet, human rights journalists continue their crucial work, using community radios to reach out to indigenous and marginalised communities, raising awareness about their rights and speaking out against human rights violations.